Let’s pretend for a minute that we’re Bohemian immigrants. The year is 1850. After a very long trip across the Atlantic Ocean we arrive in New Orleans. After another long trip up the Mississippi we arrive in Saint Louis. Remember, we don’t speak English and Saint Louis is a French, Spanish, and English speaking city. Lucky for us, we’ve found our way to a Bohemian settlement south of the city called Bohemian Hill. We weren’t allowed to settle in Saint Louis proper because the city was having a cholera epidemic and a lot of the locals thought that the immigrants were bringing the disease with them. But, it could have worse. In 1854, the year our parish was founded, Saint Louis was the site of anti-Irish riots. We may have been immigrants, but at least we weren’t Irish. Saint Louis was in the midst of an economic boom after the invention of the steamboat. Hundreds of ships docked at our port. A lot of our fellow immigrants found work loading and unloading the ships. Others, including women and children found work in the factories in the area. In 1850, Blessed Pius IX was pope. Peter Richard Kenrick was Archbishop of Saint Louis, and Millard Fillmore was president of the United States. To put the time frame in a little better perspective, it would be just 15 years before Civil War broke out in the United States, 23 years before Eads Bridge was built. It was 33 years before the first horseless carriage arrived in Saint Louis, and 34 years before the opening of Union Station. Every Bohemian who settled in Saint Louis was not Catholic. But the ones who were soon got tired of going to mass in a Church where they didn’t speak the language. So, in 1854 they petitioned Archbishop Kenrick, an Irishman by the way, for their own church. The Archbishop agreed and the new parish of Saint John Nepomuk was established. A year later, in 1855, the new parish built it’s first church and school, a wooden structure that stood on this very spot. It’s worth mentioning that in 19th century Europe, there was no such thing as “separation of church and state.” Churches were not self-funded. They were supported by the government or by rich land owners. There were no collections. When the local parish needed something, all they had to do was ask. The 1st pastor, Father Lipovsky, was born of European aristocracy and the idea of begging for money for his new parish was not to his liking. He resigned in 1856. The second pastor, Father Francis Trojan lasted a little longer, until 1864. When he left the parishioners of Saint John’s requested a native Bohemian to be their pastor and Father (later Monsignor) Joseph Hessoun was appointed. Unfortunately, he had to travel from the Old Country to Saint Louis and the blockade of the Mississippi River during the Civil War made travel up the river impossible. Father Hessoun didn’t arrive in Saint Louis until 1870. No masses were celebrated here during that time. A history of Saint John Nepomuk during Monsignor Hessoun’s pastorship would take much more time than I have today. I’ll just say that he built a new brick church in 1870 that was destroyed just 26 years later by the tornado of 1896. He led the parishioners in rebuilding the church bigger and better than it was before in 1897. Monsignor Hessoun played a huge part in the spread of Bohemian Catholicism throughout the Midwest. He traveled to Czech communities and helped them establish their own churches. He is widely considered the “apostle to American Czechs”. In his spare time he also established and edited the first Czech/American newspaper in the United States. It was called “Hlas” which means “voice” and was published at the corner of 11th and Carroll. This church has seen 12 popes, 8 bishops, and 31 presidents, pastors, 23 associate pastors, and two deacon directors. We’ve survived the Civil War, two world wars, the Korean War, the Vietnam war, the cold war, two gulf wars and the conflict in Afghanistan. We’ve survived a tornado, two interstate highways, urban flight and a massive closing or parishes in the last decades. What is it about this place that makes it so durable? Why is it still open? Maybe we should look at today’s readings for the answer. Luke writes in the Acts of the Apostles, “they devoted themselves to the teaching of the apostles and to the communal life, to the breaking of bread and to the prayers.” This is an excellent description of those early founders of our church. They built this place because they wanted to worship together, in their own language, according to their own customs. They let nothing stand in their way. Or maybe we should look at what Saint Peter said in the second reading. “In this you rejoice, although now for a little while you may have to suffer through various trials, so that the genuineness of your faith, more precious than gold that is perishable, even though tested by fire, may prove to be for praise, glory, honor, and the revelation of Jesus Christ.” Tested by fire. Imagine how the parishioners of Saint John Nepomuk must have felt when they came down here the morning after that terrible tornado and saw what had happened to the beautiful church that they had built with their own hands, at a such a great sacrifice of time, talent, and treasure, just 26 years before. They must have been devastated. But there were plenty of Catholic churches nearby, they could have just moved on. But, they didn’t. Their response was to rebuild their beautiful church, bigger and better than ever. Finally, look at the Gospel, the story of “doubting Thomas”. He refused to believe that Jesus had risen from the dead until he put his finger in the nail marks of His hands and put his hand into His side. Thomas, the doubter. What did Jesus say? “Blessed are those who have not seen and have believed.” For 160 years, in spite of so many challenges, the members of this community have believed. Today is Divine Mercy Sunday. That’s what it’s all about. God’s Divine Mercy. Just imagine if God was strictly fair. What if He was just with no mercy. You and I would be out of luck. None of us deserves to go to heaven. There’s nothing that you and I could do that would get us into paradise. We’re sinners! That’s what we are. There would be no hope for us without God’s Divine Mercy. He loves us. He wants us to be with Him. But we constantly disappoint Him. We just can’t measure up. But our God is a merciful God. That’s our faith. That’s our hope. That’s our salvation. Thanks be to God! He has shown His Divine Mercy to the members of Saint John’s in spite of all the challenges we’ve faced. One reason I believe we’ve been so blessed and have been on the receiving end of God’s mercy is our devotion to the Infant of Prague. After every single mass we pray to the Infant, promising Him the fruits of our labors. We pray, “OH DEIGN IN THY MERCY THIS FAVOR IMPART!” That’s what we pray for. His mercy. Especially on this Divine Mercy Sunday. I can’t sit down without mentioning that today is a very special day in the life of the Universal Church. Today Blessed John XXIII and Blessed John Paul II will be canonized in Rome. What a blessing it is to have witnessed the lives of these two great saints firsthand. John XXIII called the Second Vatican Council which changed the Church forever and John Paul II was such a good and holy man that he’s set a modern record for the time it took him to be recognized as a saint. Many of us had the chance to see John Paul in person when he was in Saint Louis. It was a life changing experience. We’re known as a church that venerates our saints. Now we have two more. So, as we continue with mass today, let us give thanks to the thousands of people who have gone before us from this holy place. Let us emulate them in our faith and perseverance as we move into our second 160 years. And, let us continue to ask God for His Divine Mercy, especially in our devotion to the Holy Infant. Finally, Saints John XXIII and John Paul II, pray for us. Amen. I ran into this one just the other night. A disgruntled former Catholic (Have you ever met a gruntled former Catholic?) hit me with the comment “all the Church cares about is money.” This is another myth that might be true if you eliminate the word “all”. Of course the Church cares about money. But it’s not “all” the Church cares about. It’s not even at the top of the list of the Church’s concerns. But, let’s get real. There are about 1.2 billion Catholics in the world. It takes a lot of money to provide all those people with places to worship. There are buildings to maintain and salaries to be paid. Plus, even the Church’s enemies acknowledge that the Catholic Church does a massive amount of good in the world. We feed the hungry, clothe the naked, and provide shelter for the homeless all over the world, just as Jesus told us to do. All these things take money and a lot of it. There is a school of thought that the Church won’t allow priests to be married because she doesn’t want to be financially responsible for all those wives and children. We discussed the actual reasons in an earlier post, but money is a part of. In parishes with more than one priest, all of them live comfortably in a single rectory. If you add wives and children to the mix, suddenly you’re going to need multiple rectories in a parish. Yes, that’s a big expense. Protestant church can handle married clergy because 1. They usually have only one minister at a given church. 2. Ministers wives often provide unpaid service as office managers, music ministers and Sunday school teachers. 3. Most protestant denominations are much more aggressive than the Catholic Church in encouraging their members to tithe. The big C Catholic Church may have a lot of money but on a local level, the neighborhood Methodist church probably has a bigger budget than the Catholic parish down the street. Well, what about all the great works of art that are owned by the Church? Shouldn’t she sell them to raise money to feed the poor? No, probably not. Among other things, the Catholic Church excels in preserving the arts for future generations. In times of war, churches are usually left alone. Even during World War I and II, the great masterpieces in the Vatican were untouched. You also have to remember that the Church has always been a patron of the arts. Many of the world’s masterpieces were either commissioned by the Church, or they were given to the Church by the artists or their benefactors. I’m sure that little remodeling job that Michelangelo did on the Sistine Chapel in the 16th Century kept him in paint and brushes for a long time. Here’s a little personal story. 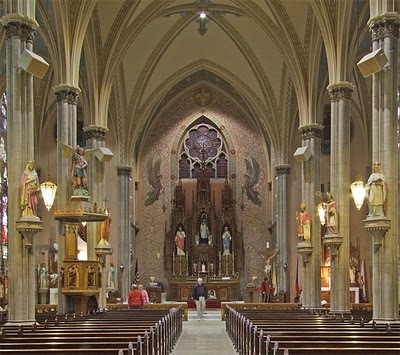 My church, Saint John Nepomuk in Saint Louis, was built by the parishioners, low-income immigrants from Bohemia, in 1870. It was spectacular! The parishioners themselves did most of the work and they were very proud of what they had accomplished, as well they should have been. The residents of the city were justifiably impressed at what the hard-working immigrants had done. Sadly, in 1896, just 26 years later, a tornado blew through the neighborhood and flattened their beautiful church. Undaunted, they began, the very next day, to rebuild. Again, the parishioners did most of the work, many of them taking time off their jobs for six months to offer their time and talent. That church remains today. I suppose the Bohemians of South Saint Louis could have continued to worship in the original log cabin church that was built in 1855 and used the money to feed the poor. But they were the poor! They gave everything they had to build a suitable house for God. Our faith community, over the last 117 years has given much more support to the local community than the cost of our church. Finally, “what about the fancy vestments that Catholic clergy wear? Most protestant ministers seem to do ok in just a suit and tie.” This is an age-old tradition of the Church. The best answer I can give to that is watch television over the next few days. The Church will install a new Pope, Pope Francis I. The pomp and ceremony you see will be amazing! This man is the leader of over 1.2 billion Catholics and the successor to Saint Peter. It would be unseemly for him to be installed in a hoodie and jeans. There’s a lot of ceremony attached to his job and he wears clothing that fits his position. Obviously, as you get closer to the local level, bishops’ outfits are less ornate than the Pope’s and priests’ and deacons’ vestments are even less. The garb we wear for daily mass is simpler than what we wear on Sundays and we usually have some special things we wear for days like Christmas and Easter. As we enter the first full week of Lent, I can’t help reflecting on all the Catholic Christians who’ve come before us. 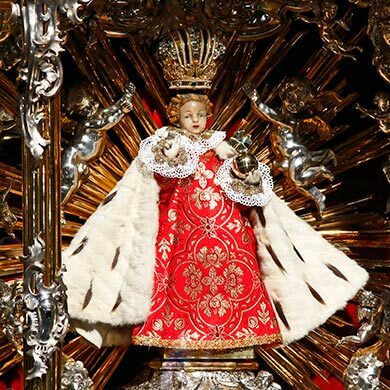 Today, my new parish of Saint John Nepomuk celebrates the ancient rite of crowning the Infant Jesus of Prague. This juxtaposition of the child Jesus with the trappings of Christ the King is a wonderful symbol of the richness of our faith. This afternoon our auxiliary bishop along with several priests and deacons will be present as a young man of the parish places the crown, made of gold and jewels donated by parishioners sixty-two years ago, on the Infant’s head. You may or may not be familiar with the ceremony, but it’s been going on for centuries. Our statue of the Infant Jesus is a replica of the one that is housed in the church of Our Lady of Victory in the Lesser Town district of Prague. It’s believed that the original was crafted in Spain in the early 16th century. You can click on the link above to find out more of the history of the statue and of the veneration. What I really want to talk about today is the tremendous wealth of experiences we have as Catholics. Today’s devotion will be a beautiful event for everyone who attends. But, over the last few weeks I’ve had the privilege of watching the members of my new church family as they prepare for today’s crowning and the dinner that will follow. To say that today’s event is a big undertaking would be a gross understatement. It’s taken a lot of work by a lot of faith-filled people to get it done. And you know what? They wouldn’t have it any other way. As a newcomer and a relative outsider, I’ve watched everything come together and I’m in awe of the spirit of love and cooperation that I’ve seen. I think this is when our Church is at its best; when a group of people come together to put on an event that reflects our Catholic heritage, sometimes our ethnic heritage, and the spirit of a group of faithful people with a common interest. I’m excited about today’s crowning, but I’ve already been deeply touched and inspired by the efforts of the people of my new church home. We all owe a great debt to the men and women who have come before us. They’ve carried on our faith, often against almost impossible odds. My “new” parish is 157 years old and I’m deeply grateful to the thousands of worshipers whose lives have revolved around their church. I’m humbled by the responsibility I feel to them to maintain and even to grow their parish home. This weekend was my first to preach at my new parish, Saint John Nepomuk Church. Here’s the text of my homily. Enjoy. It’s true, I am a stranger. In fact, a lot of people might tell you I’m stranger than anyone you know. But the Archbishop sent me, so here I am. In fact, here’s what the Archbishop wrote to me in my letter of appointment. Don’t ask me why he chose an Irish deacon to serve the oldest Czech church in North America. He had his reasons, I guess. But as I thought about it I realized that throughout the history of the Church, men and women have been sent to serve people of other nationalities. My own patron saint, the patron saint of Ireland is an Englishman named Patrick. That seems to have worked out pretty well. Anyway, I thought, I’d tell you a little about myself this afternoon (morning) so you get an idea of where I’m coming from. Hopefully, over the next weeks and months, I’ll learn more about you. But, keep in mind that you only have to learn one new person. I have to learn about all of you. If you greet me after mass today and introduce yourself and I forget your name by next week, please don’t be mad. It’s one of the hazards of age. I don’t remember what the others are. I was ordained by then Archbishop, now Cardinal Rigali in June of 2002. That means I’ve been a deacon for (count on fingers) almost nine years. I’ve been married to my lovely and talented wife, Jan, for 42 years. She’s given me four wonderful kids, who are actually adults now. I still call them “kids” which they may or may not like. But, if you’re a parent you know that they’re always your kids no matter how old they get. Two of my kids have kids of their own, for a total of four grandchildren. I may brag about all eight of them from time-to-time but usually only to make a point. I hope you’ll bear with me. I’m more than happy to listen to you brag about yours any time you want. If you’re interested, I do have pictures. I’m not a cradle Catholic. I was raised a Baptist and converted to Catholicism when Jan and I were married in 1968. It’s am interesting story. I’ll tell you some day, but not today. This might be a good time to mention that there will be a parish meeting tomorrow (this) morning after (9:30) mass. The purpose of the meeting is to discuss plans for 2011 events. It will also be a good time to ask me any questions you might have. I hope you can make it. In the second reading today, Saint Paul writes to the Corinthians that “there should be no divisions among you, but that you be united in the same mind and the same purpose.” Hopefully you and I are united in the same purpose. I take Archbishop Carlson’s words very seriously, that I am to work with you and for you. I know some of you may be disappointed that he didn’t send you a priest/pastor. But we have to deal with the reality that their aren’t enough priests to go around. The good news is that this Archbishop doesn’t like to close churches. He’s appointed a committee to look at new and different models for keeping them open. This community has a prominent place in the history of the Archdiocese of Saint Louis and you have a chance to make history again. If you and I are successful here, we’ll give other smaller worship communities a model to follow. In our Gospel today, Jesus calls Simon and Andrew, and James and John and promises to make them fishers of men. He calls you and me to be fishers of men, too. As I wrote in this week’s bulletin, there is no greater good that you and I can do than to bring others to Christ. That’s our common purpose. That’s what Paul asked of the people of Corinth and that’s what Christ asks of you and me. Jan and I were members of Saint Bernadette parish in South County for thirty-five years. I’ve been a deacon there since I was ordained. It’s been our church home for more than half our lives. I thought long and hard about accepting this new assignment. I was very comfortable at Saint Bernadette. But, you know what? I wasn’t ordained to be comfortable. I was ordained to serve God’s people. And He’s called me to serve you. He’s also called you to serve one another. Therefore will I trust you always though I may seem to be lost and in the shadow of death. I will not fear, for you are ever with me and you will never leave me to face my perils alone. Everybody who’s in the public eye knows that there are always people watching. Whether you’re the Son of God, the Holy Father, a bishop, priest, or deacon, you know that you’re being observed. Most people are watching, hoping for something good. But there are always a few, like the Pharisees, who want to see you mess up. With the 24 hour news cycle and the Internet, the scrutiny is non-stop. It seems there is always someone with a microphone, or a camera, or both to record your missteps. I’m particularly aware of this as I start my new assignment this week. Having been at Saint Bernadette for so many years, I know you pretty well and you know me. I have a pretty good idea of what I can say and do without causing too much consternation. I feel comfortable up here (on the altar) knowing that I’m among friends. This weekend I’ll be meeting the members of my new parish. I have no idea how they’ll react. They may like me or they may not. I’m sure some (a lot?) of them are disappointed that they don’t have a pastor anymore. Will they see this new arrangement, having a deacon in charge, as a glass half full or half empty? Even if they welcome the chance to keep the church open and to potentially grow their community, there’s still the question of this historically Czech church welcoming an Irish deacon.